Isabella Pacheco de Braga Ventura was one of my Grandfather’s cousins. Isabella was born to Joao Pacheco and Joanna Gonsalves Cardoza. When she was a young girl, he father died and her mother had no financial capacity to take care of her children. She gave Isabella away to a relatives who were unable to conceive, Jose de Braga and Maria Jacinto. As the story goes, Isabella did not know that she was adopted. Though, since she grew up with her siblings and they all had red hair, I suspect she might have guessed. But, it was on her wedding day that her adoptive parents chose to tell her who her real mother was. I wish I had been able to talk to Isabella when I started my tree. She was old and feeble by that time. I would have liked to ask her what that was like. Did it cause problems or did she accept it easily? Isabella was well liked. Mention “Bella Ventura” to relatives and they all seemed to know who you were talking about. This photo shows her on her wedding day. 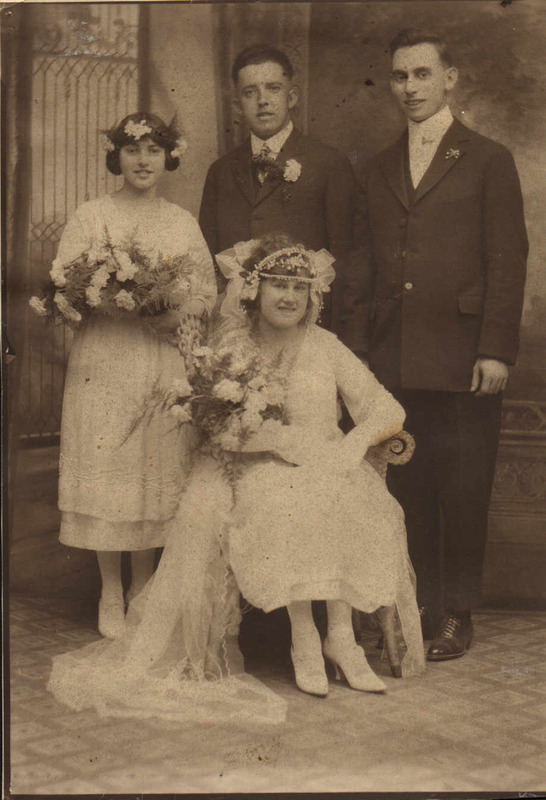 My great uncle and aunt, Jose and Minnie (Ventura) Pacheco Smith are in the photo. Isabella’s husband, Manoel Ventura, is on the right. I knew as a young child she was adopted. She was very excepting of it and told me great memories as an “only”child. I may be mistaken but I think she knew she was adopted as a child.